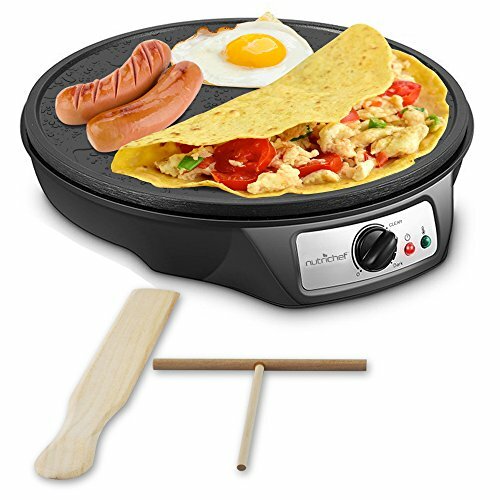 The NutriChef Electric Crepe Maker & Griddle provides you with convenient food prep ability. The compact tabletop design is easy to use, allowing you to create delicious desserts like crepes and blintzes -- or use it to whip up a quick breakfast including bacon, eggs & pancakes! The non-stick aluminum cooking surface features a wide 12'' inch diameter cooking surface with a temperature adjustable rotary control knob. Enjoy hassle-free hot plate food preparation with the NutriChef Electric Crepe Maker & Griddle.